What is great about flyfishing these days is that you can be almost anything that you desire, and the tools are there to make these dreams come true. This is so with flytying, where old school traditionalists and new school revisionists have a happy and desirable place in the scheme of things. Sure, there may be the odd friendly debate about who is closer to god with their particular mix of steel and materials but no blood ( or very little ) spills onto the floor. We all wave our creative offerings over many different waters and fish, with a great deal of satisfaction. Some of my more lineal thinking -friends have, on occasion, accused me of using "lures". I get a real kick out of looking in places that arent oriented specifically to fly fishing for interesting items that may have utility at the tying bench or on the water. Recently, my infatuation has been with fabric paint because of its potential for use in tying and other aspects of flyfishing. Fabric paint may be to the fly tier/fisher what duct tape is to the world :- you know, a million uses and still counting! Im sure that others are using this stuff, but Ive not seen any reference to it in current books and periodicals. I got the idea from fly club friends who use it to dob eyes on minnow patterns for cutthroat trout. That got my few remaining grey cells motivated to try a number of uses for the paint, and Im sure I havent exhausted them all, so there is still a lot of room for innovation. So why fabric paint? What will it do? Is it truly a magic elixir? Fabric paint is the stuff that crafters buy at craft shops to creatively decorate clothing. Judging from the variety of paints, associated tools and instructional books, this is a very popular hobby, so supplies of the stuff should be with us for some time. Fabric paint has a number of advantages for the flyfishers: its reasonably inexpensive ( 20 bucks will get a good array of colours and types); its readily available ( almost all craft shops); its durable and tenacious, and will cling to a variety of surfaces ( remember it must withstand the rigors of T-shirt life, which includes the washing machine! ); its easily dispensed ( the small bottles have a fine-tipped dispenser from which the paint is applied); it has great shelf- life ( unlike so many glues and paints, this stuff never seems to dry-up, and is always ready to flow freely) and it comes in an astounding selection of types and colours, many of which are ideal for our use. Fabric paint tends to be rather viscous ( thick) and holds its shape quite well upon application. It dries to shape very quickly ( about 10 minutes) and is ready for touch and use overnight. The brand of fabric paint that Im partial to is manufactured by "Plaid". It tends to be a little cheaper than some of the other brands, and I like the dispenser bottle - its very easy to use. "Plaid" is available in several categories according to the final "look" of the paint and there are a multitude of colours within each category. The paints most useful to the fly angler within each category are: "Shiny" ( clear - this goes on an opaque white but dries clear, black ) ; "Metallic" ( gold and sterling are solid colours ) ; "Sparkles"( ice, citron and a variety of others. They have fine sparkles in a clear base - these are really neat!) ; "Neon" ( red, hot pink, chartreuse - really bright!) ; "Glitter" ( gold and silver - these are fish scales without equal!) ; "Pearl" ( white - very "fishy") and last but certainly not least, - are you ready for it - "Glo-in -the -Dark" ( whooo - let your mind run free on this one -it should be illegal! ). For baitfish imitations in salt and freshwater - use this paint ( clear, coloured, sparkle or glitter ) to coat bodies and heads that have stick-on eyes. This makes tinsel bodies and eyes very durable. The end result is almost as good as using 2-part epoxy but with considerably less fuss. For heavily- coated bodies and heads consider turning the fly to prevent paint sag. Also, use the paint to dob on bait fish eyes ( try a tapered-end barbecue skewer, cut to appropriate for a larger round yellow or white iris and a smaller black pupil). For steelhead and salmon "attractor" patterns in fresh and salt water - add fluorescent accents, especially to the finished fly heads.Also, bodies can be coated. 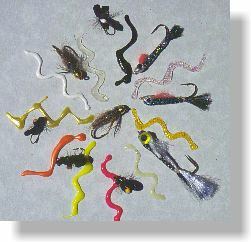 Add a dot of colour to the bead on "bead- head" wooley buggers. The "neon" colours are great for these applications! For freshwater patterns - try a tiny dob of white or neon on small foam- bodied dry flies ( ants, beetles, hoppers) to act as "sight assistors" in poor visibility conditions(which for most of us ageing types is always). You can also try a bit of sparkle, glitter or glo-in-the-dark on the bodies of nymphs, larvae or water boatmen patterns, to simulate captured air bubbles. coat all types of line /leader/backing junctions for strength and smoothness - clear is very good for this. It can be used the same as other adhesives, such as pliobond or aquaseal. mark a flyline tip with the line weight - it can be confusing when we own a number of fly lines. Some day well lose track of what the line weight is.The tip of the flyline can be marked with fabric paint, using a coding system for weight that will provide instant recognition. ( i.e. 6 small dots equals a #6 flyline or whatever symbol system you may wish to devise ). 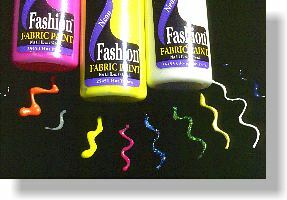 create a "nymph tip" indicator on a floating fly line - paint the first few inches of the line with one of the neon colours to assist line tip visibility for fishing nymphs in streams or lakes. It is a bit tricky to get really smooth coverage with the paint, so you may want to experiment on an old bit of line with different applicator tools ( try a small, soft, cheap brush). mark fly boxes and reel spools - the paint works well on these items to create a durable label of contents ( i.e. "WF#6F" on the back of a spool or "Dryflies" on the outside of a flybox). develop sinking leaders - if you have access to powdered lead from a chemical supply place, try mixing a bit of the lead with a fabric paint of your choice ( probably clear) and coating it onto leader knots and/or sections ( This is a bit extreme, and may be only for those on the outer fringes of innovation). For those who are appearance conscious, there are also a myriad of ways to use the paint in its traditional manner to make a fashion statement. Try decorating shirts, wader belts or other articles of clothing with painted flies, fish or your own logo. Using fabric paint as a magic elixir may be the product of an overactive imagination but you will have to admit that there are some useful attributes for it in the world of fly fishing. I suppose that some that will cringe in disgust and opt for the less interesting route of the tried and true, but whay not give it a whirl and report back!